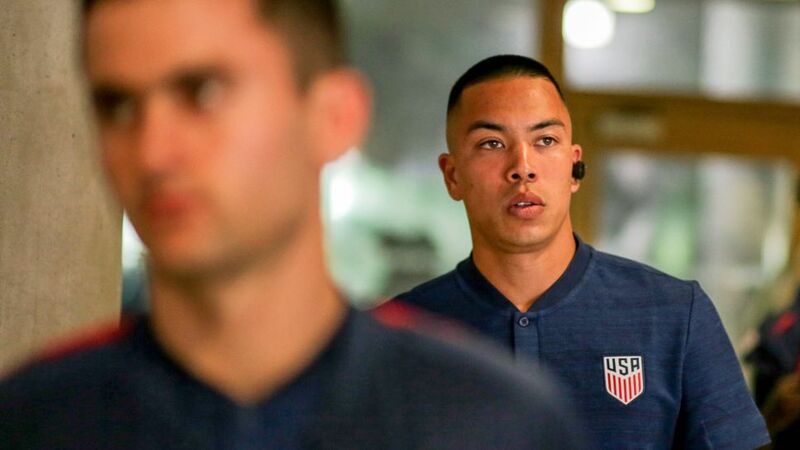 Following Bobby Wood's transfer from relegated Hamburg to northern rivals Hannover, bundesliga.com takes a look at why the transfer could pay big dividends for the USA striker and his new employers. Any professional player will tell you that playing under a coach that did not sign you is always tricky. And Hamburg's on-field struggles over the last few years have had the unwanted side effect of managerial changes off it, as the club searched for solutions in their efforts - ultimately in vain – to avoid relegation. Bruno Labbadia was in charge when Wood joined in summer 2016, but since then HSV have had three more coaches, meaning the 25-year-old has not had the continuity he perhaps would have liked. With a fresh start at pastures new, Wood has the conditions he needs to thrive at Hannover, especially as head coach Andre Breitenreiter was the driving force behind his recruitment. "Bobby and I have been in touch for several weeks," the 44-year-old told Kicker prior to Wood's switch. "I'd be very happy if the transfer came through." Now that he has got his man, Wood will keen to repay the faith put in him. Although Wood did not suffer any serious or long-term injuries last season, he only started 18 – just over half – of all Hamburg's league games, of which he was substituted off 11 times. This too will have done little to help him get into a groove and find a run of form. That should be different, though, at Hannover. The departures of attacking players Martin Harnik, Felix Klaus, Jonathas, Kenan Karaman and Charlison Benschop make Wood the prime candidate to partner Niclas Füllkrug up front. Why is this a good thing? Well, the last time Wood had stability, game time throughout a full season and, more often than not, a partner in attack, he hit 17 goals for Union Berlin in 2015/16. There is a prevailing belief that mid-table teams simply lump long balls forward to a big target man, which is a role Wood is wholly unsuited for. A stocky 5'10" forward, he only won 39.1 per cent of all duels last season, and just one in three of all aerial challenges. A perfect fit, then, for club and player with Breitenreiter preferring his side to play on the ground, making rapid counter-attacks when they regain possession. Wood, who loves to use his pace and instinctive movement to beat defenders, will go hand-in-hand with this style. After all, Hannover may have finished 13th last season but they like to attack, and in terms of goals scored they were ninth overall. Harnik, whom the Honolulu native is ostensibly replacing, is not a bulky target man either, but he still scored nine times last term. Wood's return of 12 goals in 39 senior caps for the USA is very respectable at international level, and he led the line during his country's ill-fated 2018 FIFA World Cup qualifying campaign, as well as in recent friendlies. However, interim head coach Dave Sarachan has made a point of calling up the next generation of players since taking the reins from Bruce Arena in October 2017, including the likes of Werder Bremen teenager Josh Sargent to keep the first-team regulars on their toes. If Wood can play and score regularly in the Bundesliga,it will do his chances of retaining his place in the side no harm ahead of 2019 CONCACAF Gold Cup next year. Every professional player has their story, and for Hannover, they've found a player in Wood that will never give up; a characteristic he showed in coming from Hawaii to Germany as a teenager. He battled injury - which almost ended his career - and so much more, as he describes in his Player's Tribune article written in March 2017. Wood describes watching his first World Cup, in 2002 aged nine, and not knowing what was happening. After being pushed into football by his mother, the Honolulu-native's path lead him to Munich where language barriers, cold weather, homesickness and eventually injury almost sent Wood home. But as he says, he took it "one day at a time." Fighting back from a knee injury that almost left him without a club, he battled his way to the Bundesliga - and to play in the league is indescribable, even for him. "Walking onto the pitch in front of thousands of screaming fans every weekend - it's unlike anything I ever could have imagine. I didn't understand what this sport means to people. Or, really, what it could mean to me. I get it now."